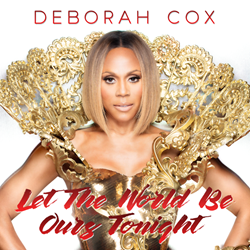 Grammy® Award-nominated and multi-platinum R&B recording artist and film/TV and Stage actress Deborah Cox’s latest single “Let the World Be Ours Tonight” has secured the number one spot on Billboard Magazine’s Dance Club Chart for the week of September 16, 2017. “Let the World Be Ours Tonight” made its “Hot Shot Debut” on Billboard’s Dance Club Chart at #37, and reached the #1 position after just nine weeks on the chart. This marks Cox’s thirteenth number one single on Billboard’s Dance Club Chart. The single joins Cox’s other Dance Club Chart Number Ones including: “Higher” (2013),“If It Wasn’t For Love” (2012), “Beautiful U R” (2009), “House Is Not A Home” (2006), “Play Your Part (remixes)” (2003), “Mr. Lonely (Remixes)” (2002), “Absolutely Not” (2001), “I Never Knew” (2000), “It’s Over Now” (1999), “Nobody’s Supposed To Be Here” (1998), “Things Just Ain’t The Same” (1997), and “Who Do U Love” (1996). Deborah Cox is best known for her 1998 hit single “Nobody’s Supposed To Be Here,” which held the record for the longest-running number one single on Billboard’s Hot R&B/Hip-Hop Singles & Track Chart (14 weeks), a record held for nearly eight years. That single earned her an NAACP Image Award nomination, a Soul Train Award, A Lady Of Soul Award, Best Female Vocalist Juno Award nomination and a Billboard Music Award nomination for R&B Single of the Year. The Canadian born star co-wrote the feel good single with UK production team SOULSHAKER (Warren Meyers, Gary Manktelow, Matt Meyers) and Jenna Doyle of Audiofreaks, one of the most prominent songwriting, production and remix teams in the world of club, dance and pop music. The powerful anthem beautifully delivers a message of acceptance, hope, and love, a theme which Cox has stayed true to throughout her incredible career and has helped her become a beloved iconic figure in the LGBTQ community. In 2015, she received the Out Music Pillar Award; she was honored by The Harvey Milk Foundation at Diversity Honors for her efforts in the fight against HIV/AIDS in the LGBT community. With the help of remixes from some of today’s top producers including StoneBridge, Tony Moran, Bimbo Jones, Dasco and more, “Let the World Be Ours Tonight” has been resonating on dance floors all over the world.